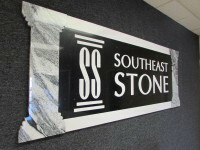 Our showroom houses all of the latest products carried by Southeast Stone — allow us to walk you through your personalized project from start to finish! From stone samplings and edge profiles to giving you a live preview of your envisioned design — take advantage of all we have to offer. Our showroom holds projects completed with the latest of our technologies that can stand as the source of your inspiration for your new home!